Illusion | Outfits - Do You Speak Gossip?Do You Speak Gossip? I got the inspiration for this outfit, from a latest streetstyle look of one of my favorite fashion bloggers, Nicole Warne, of Gary Pepper during Paris Fashion Week earlier this week. I immediately remembered all the different ways I was going to wear this scarf, when I first bought it, but then stuck to the usual (and obvious one!). 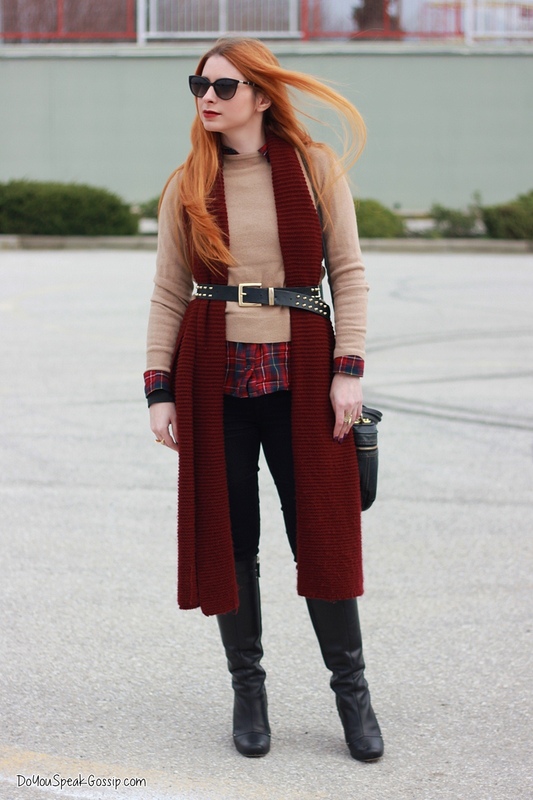 This scarf is one of my favorite winter pieces, because it’s really warm and it instantly upgrades a look. Today, I decided to wear it as a belted cardigan, hence the “illusion” in the title. If you had seen it in real life, it looked like a long knitted cardigan from the front, but you got a surprise when looking from the back. 😉 What do you think? Σε ευχαριστώ πολύ κούκλα μου! Πάντα μου φτιάχνεις την διάθεση! That was exactly what I thought, that it was a long cardi, and then I looked better and read your description and saw it was a scarf! I loved it, specially the color! The boots are also marvellous and the pictures are really great! I like the fact that it is warmer, cause you could wear an outfit without a coat! So good, spring is coming! You always look beautiful, you know, and this time again! Very nice look, indeed! Makia! Thank you very much Denise. I really liked the idea of wearing the scarf this way. It was something completely differnet and I loved it. It wasn’t so warm, but I could take pictures without my coat on, for a few minutes. As you know it’s really difficult to show an outfit, wearing one, so I’m always trying not to wear it at least in some of my photos. Unless it’s that new mint one, which is always a part of the outfit. hehe But yes hopefully spring is coming. Thank you very much Olie! Glad you liked it! Είναι ένα από τα ωραιότερα outfits που έχω δει! marissa recently posted..Cherry on top! Πολύ ωραία η ιδέα σου να το φορέσεις έτσι το κασκόλ Μαρκέλλα μου!! Μπράβο σου..
Πραγματικά φανταστικός ο τρόπος που φόρεσες το κασκόλ Μαρκέλλα! Theano recently posted..Fashionizein meets Daniel Wellington!